Well, this is quite the repulsor blast from the past! The Iron Man 2 Value Packs were 3-packs exclusive to Target. While there were multiples planned, only 1 made it to retail. 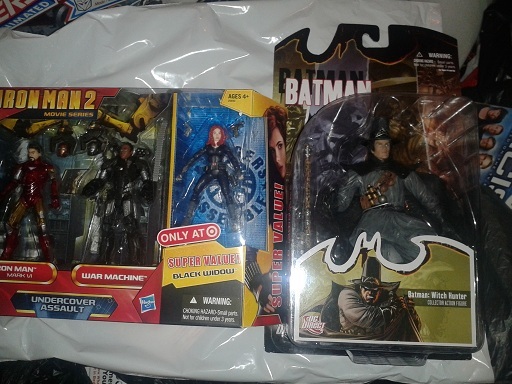 The rest were canceled, with some loose samples of unmasked War Machine & Black Widow turning up for auction online. It’s been a few years so I’m not really sure, but this may actually be the 1st time we have seen these figures packaged! Panthro1978 found this in a store called TK Maxx in the UK. Trebleshot has mentioned that the same company that owns TK Maxx also owns TJ Maxx/Marshalls, et al, in the US. Cross your fingers that this set finally makes its way stateside! Discuss on the Toyark Forums› Views: 5846 › Credit: Panthro1978 of the Toyark Forums! Ooo... a 3.75" Tony Stark headsculpt with hair. And IMO that is so weird that TJ Maxx is called TK Maxx in the UK. LOL. That is an epic cool find though. Just been to my local store and managed to get the last 1. BUT I did manage to get their last two "Fury of Combat" sets. They had them for �14.99 each. I can't remember which UK supermarket Target is the equivalent of... Is it Tesco? TK Maxx seems to get a lot of end of line stock. It's been a good place to snag Universe Transformers in the past, too. 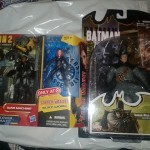 You are not a MU collector but your forum name is Warmachine?! Anyways, if your from the US you could say TKMaxx is abit like Ross dress for less. It usually has more clothes and home ware then toys. I never really go in there but now I might make a habit of it. There's more Marvel toys than 3.75 scale. Can report from Ireland that only few arrived! So far only one of four Tk Maxx stores in Ireland got that Iron Man 2 set! And they only got 2 and so far outside the capital only one other store has got them! This is great . I can go to Marshalls on a weekly basis while I am killing time during lunch. TJMaxx is too far so I may only go there twice a month. I wouldn't be surprised if this comes to Winners in Canada before (if ever) it comes to TJMaxx/Marshalls in the U.S. I will stop using the old thread now that we have this new one. Thanks a ton to everyone that has reported their findings. Are those Iron Man 2 Figures 6 inch or 3 & 3/4 inch? Here's hoping they find a way to slot those heads and figures into the Avengers Assemble line or something. We need a real tony stark head already. Business suit would just be a plus. Now we have the suit, we have the head. Just put them together! Tesco has been partners with Walmart. So yeah I suppose they would be similar. TK Maxx is TJ Maxx over here. Welcome to The TJX Companies, Inc. If anyone comes across any extra I wouldn't mind trading. Tesco partners with Walmart? No chance. Walmart owns Asda, and Asda is the bigges supermarket alongside Tesco. Never in a gazzillion years would Walmart partner up with Tesco. TK Maxx is so called because there is an existing store called TJ Hughes in the UK which is a similar type of shop. When TJ Maxx came over, they thought it would create confusion, and a possible claim for tortious passing off, so they changed it to TK Maxx. We have no version of Target. If the UK gets something like a Walmart exclusive or Target exclusive, its because those shops have distribution rights for the US. So the Walmart Spidey 6 inch figures showed up everywhere over here because Diamond were allowed to distribute them outside the US. Odd that these have shown up here first, will be on the lookout for these. anyone have one for sale or trade? Really really would like to own this set. Ah ok I mixed those 2 stores up. I also wouldn't mind getting one of the sets. I went to 2 other stores yesterday and only found the Fury 4 figure sets. Some guy was selling this 3 figure set for �139.99 (with 2 bids) and his description was saying that its 1 of 4 he knows about in existance! hour later there was 7 for sale. Gonna hold onto mine for abit. I only managed to get 1 (also got 3 of the Fury sets). Idon't like the Black Widow figure as much as the Avengers one. Seems abit simply in its detail. Smyths toystore over here sometimes gets Target exclusives. Mainly TF.